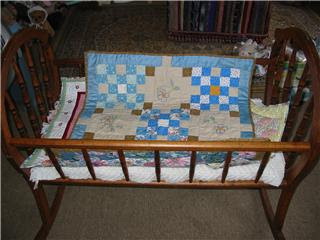 Blue baby quilt with embroidered motifs. My first sale! 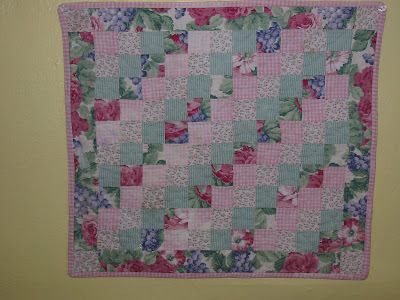 Pink, hand stitched and quilted, with an embroidered border with green vine and rose flowers. I'm a little sad to see it go to a new home but I am so pleased it's new owner adored it. Love at first sight, I may say. And, I have moved on to many, many more, completed and in the works. The wee yellow quilt is now awaiting a new home. 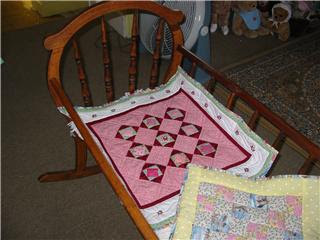 This teensie pink and green quiltie comes from the old vintage days, like me! The colors are so soft and faded from many washings. Given to me by a friend, it hangs in the studio for my viewing pleasure. Did you ever think, child, . . . how much piecin' a quilt's like livin' a life? And as for sermons, why they ain't no better sermon to me than a patchwork quilt, and the doctrines is right there a heap plainer'n they are in the catechism. Many a time I've set and listened to Parson Page preachin' about predestination and free will, and I've said to myself, "Well, I ain't never been through Centre College up at Danville, but if I could jest get up in the pulpit with one of my quilts, I could make it a heap plainer to folks than Parson's making it with all his big words.' You see, you start out with jest so much caliker; you don't go to the store and pick it out and buy it, but the neighbors will give you a piece here and a piece there, and you'll have a piece left every time you cut out a dress, and you take jest what happens to come. And that's like predestination, But when it comes to the cuttin' out, why, you're free to choose your own pattern. You can give the same kind o' pieces to two persons, and one'll make a 'nine-patch,' and one'll make a 'wild-goose-chase,' and there'll be two quilts made out o' the same kind o' pieces, and jest as different as they can be. And that is jest the way with livin'. The Lord sends us the pieces, but we can cut 'em out and put 'em together pretty much to suit ourselves, and there's a heap more in the cuttin' out and the sewin' than there is in the caliker. new light in the hearts of people.